Welcome to our gallery showcasing a range of the best sofas available for making your man cave the best space in your home. We know that the key to turning a good man cave into a great one is a perfect sofa, one that will anchor the entire space in comfort and style. Speaking of style, we know that there is no single definitive style for man caves. They are as diverse and varied as home interiors themselves, often tailored toward the homeowner’s personality in unique ways. One of the most common ways in which people customize their man caves is the furniture selection. If you’re transforming an existing room into a man cave, the furniture is the easiest and most obvious way to start. Whether you’re leaving a room decorated as-is, simply applying a new coat of paint, or performing a complete overhaul, you’re going to be selecting some new furniture. Basically, it’s a foundation of man cave creation. Because man caves all demand a certain level of comfort, sofas are the go-to piece of furniture. A great sofa will add loads of style and comfort in equal measure. You can effectively center your man cave design around the right sofa! We grabbed fantastic examples of many popular styles of sofa, including our top featured example, pictured above. 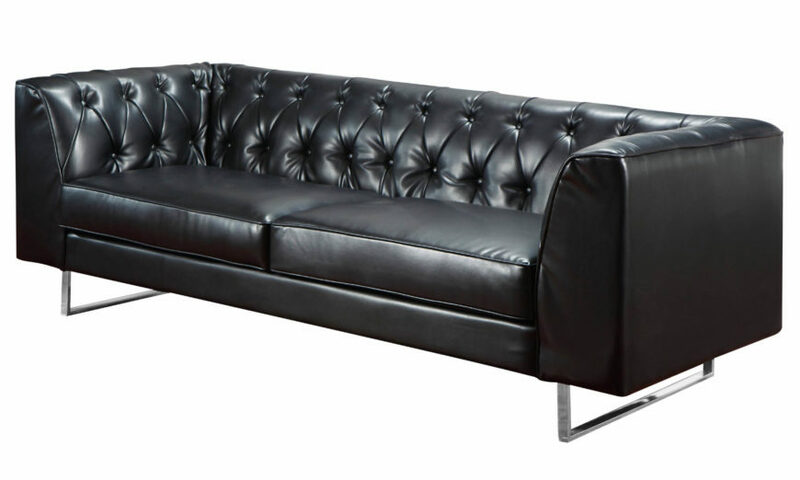 This contemporary design in black leather features a button tufted back and clean, minimal lines that would fit well in any modern styled space. Because the wild range of man cave styles springs right from the individual homeowners themselves, we can only imagine the specific details of the rooms. However, we can make a very educated guess about what sofa might be right for your particular man cave. Thus, we present the following collection of beautiful sofa designs, covering a wide spectrum of style and luxury. We have a handful of subcategories to better help you find what you’re looking for. You’re sure to find something that would fit perfectly in your own home, or at least something very close to the ideal in your mind. With these great examples, we hope you feel inspired to plan out or complete your own man cave! Traditionally styled sofas are perfect for the more elegant end of man cave setups. These beautiful pieces of furniture add a dose of richness, formality, and of course, comfort to any space. They’d be right at home in a room fit for cigars and brandy! 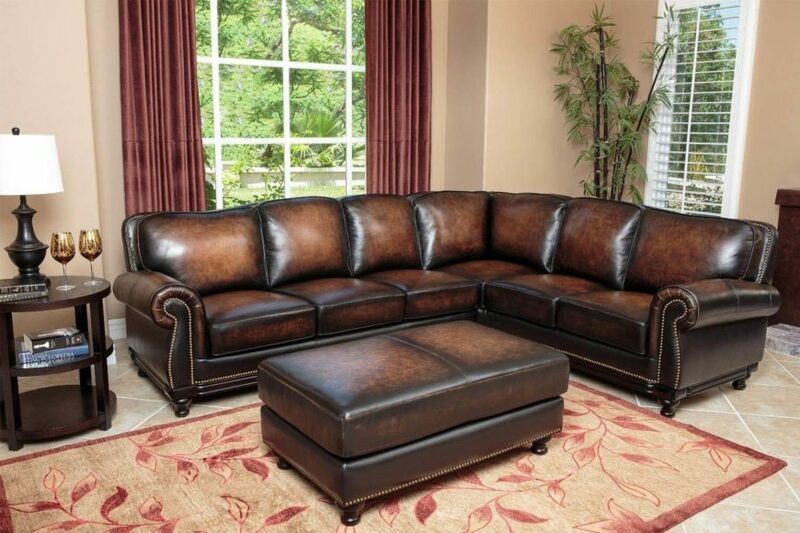 Here is a perfect example of a classically styled brown leather sofa with rolled arms. 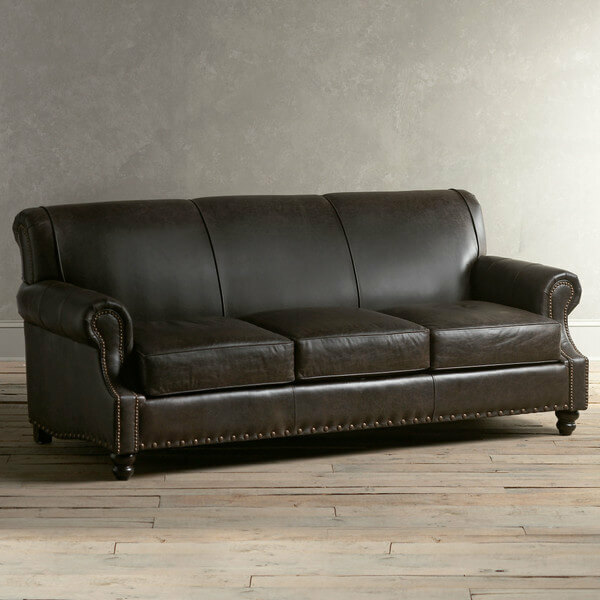 The traditional looks are bolstered by button tufted Italian leather and a natural wood frame. 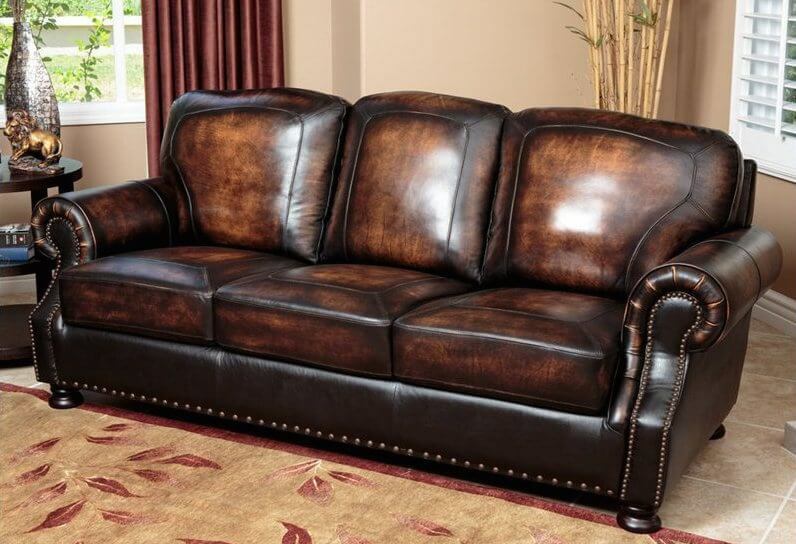 The rich burnt tone of this luxurious leather sofa enhances the sense of traditional charm. Roll arms and base feature nailhead trim, while the carefully detailed cushions infuse a sense of precision. 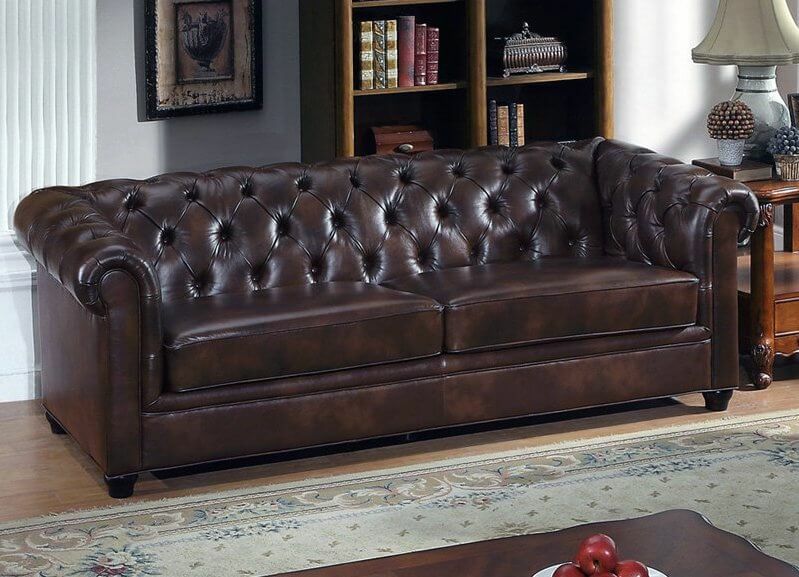 This bespoke dark mocha toned leather sofa is perfect for any traditionally appointed man cave. The arrowhead feet and nailhead trim add a sense of sharp detail while the broad, smooth backing adds an open, minimalist face that emphasizes comfort. 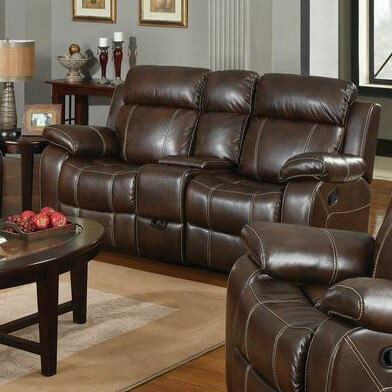 Reclining sofas are the best choice for anyone seeking the best combination of comfort and utility. These sofas do everything a standard design does, while offering that extra layer of relaxation. Even better, most of these sport the added benefit of hidden storage options. 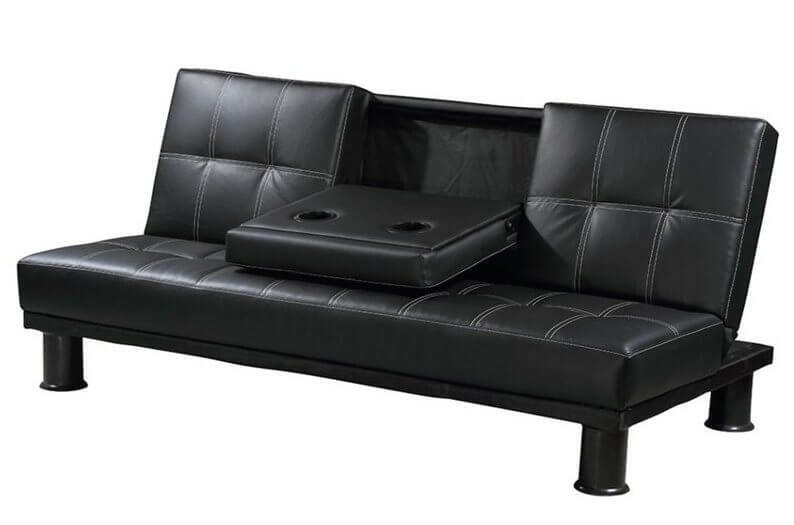 This ultra-comfortable sofa features a dual-reclining design for maximum comfort, plus a unique storage console in the center. Nailhead trim and roll arms emphasize the old fashioned luxury of the sofa. This dark chocolate toned leather wraps a traditional frame, hiding a central built-in storage console and cupholders. The pair of reclining seats feature thick cushioning and seamless integration. 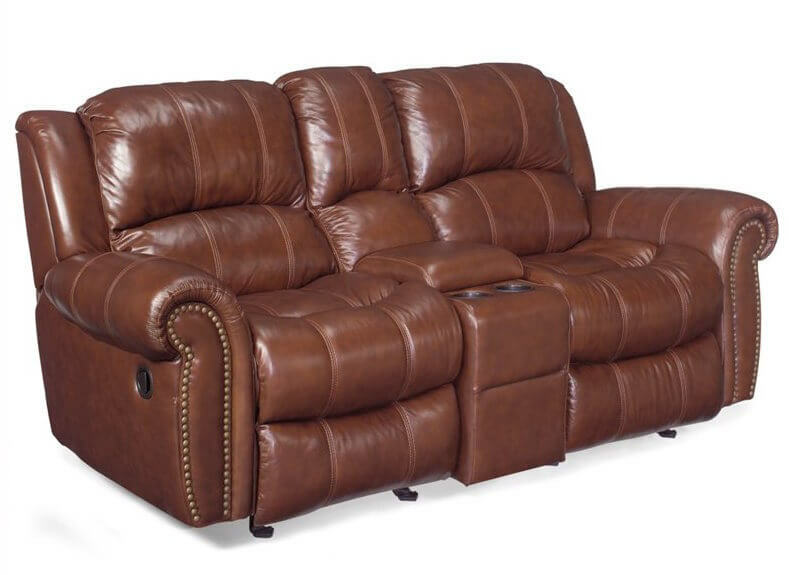 This gorgeous recliner features bright stitching across a deep chocolate leather body for a high contrast, detailed appearance. 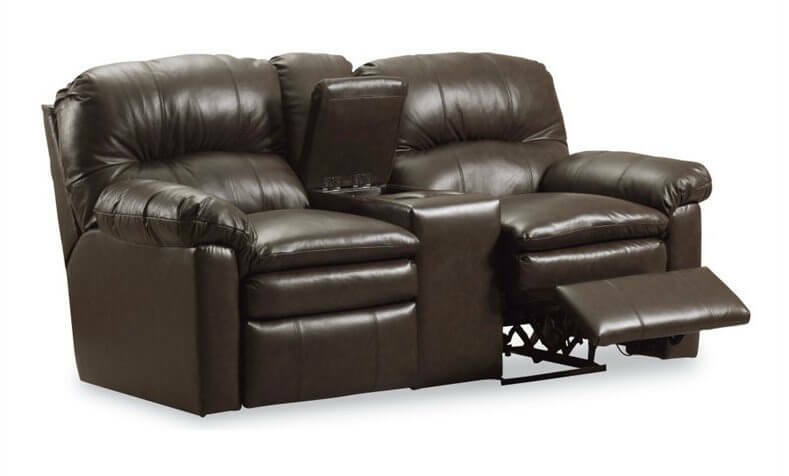 It completes any man cave in need of some serious dedicated comfort, with the added help of some built-in storage. 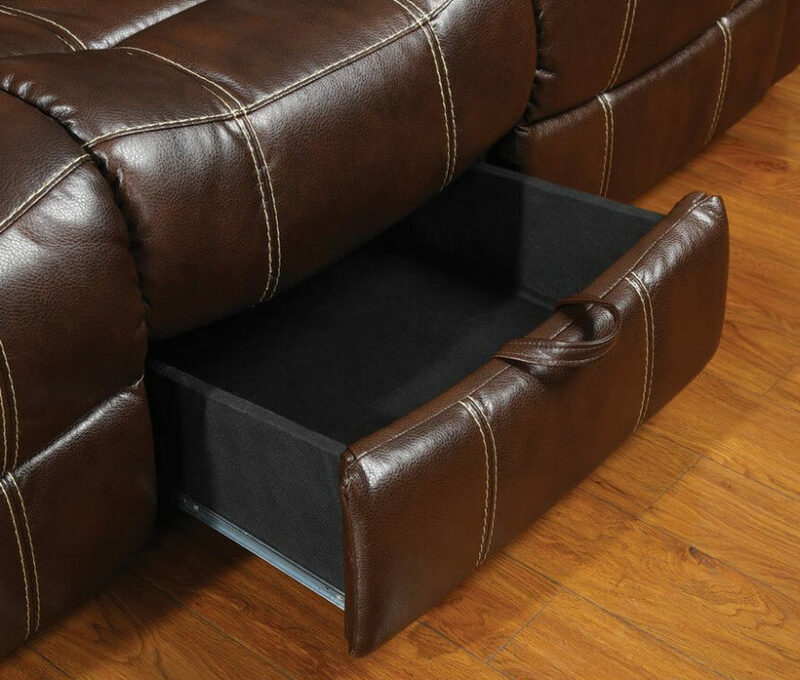 The sofa features a unique pull-out drawer at center, discreetly adding space for remote controls or anything else you may need handy. 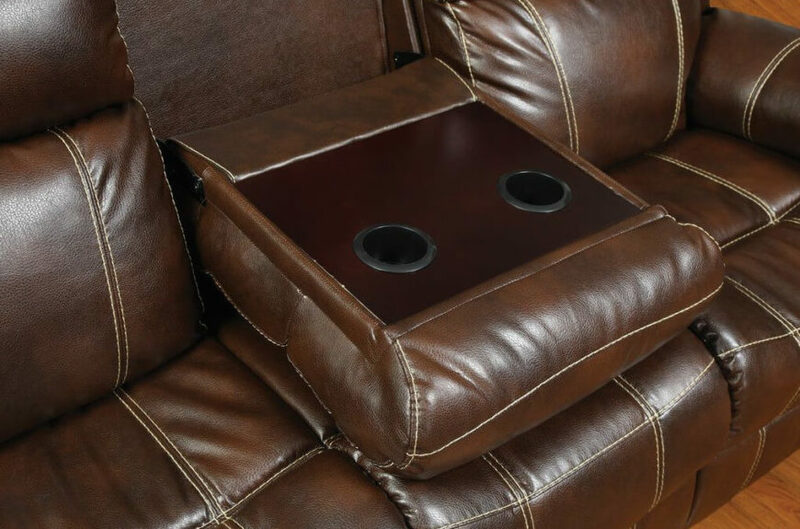 Flip the center back down to reveal a beautiful wood finish platform for drinks, snacks, and remote placement. Hidden compartments like this greatly increase the utility of the sofa. This sofa showcases the truly versatile end of the recliner spectrum, with a full three sets of reclining seats between its thickly cushioned arms. Even better, the middle back can be folded down to reveal cupholders and a spot for snacks. These sofas are ones which look best in a modern or contemporary styled man cave, those in which clean lines, subtle tones, and a sense of space prevail. The sofas in this category have a sleek appearance and often surprising features. This modern design sofa boasts a unique storage element, with flip-up armrests that conceal a wealth of storage space below. The clean lines and elegant shape of the sofa would look at home in any contemporary man cave setting. We love convertible sofas because they offer an added layer of comfort when transformed into their bed configuration. This black leather example features a fold-down cupholder and dining platform, plus light stitching for a high contrast look. 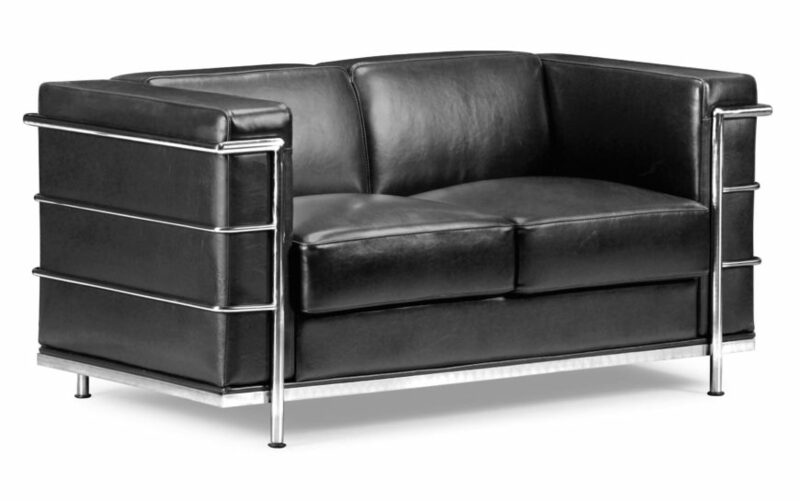 We love the classic lines of this midcentury modern design, with a chromed metal frame wrapping bespoke black leather in a sharp edged frame. The high contrast look would work best in a modern setting, but could spike a more traditional room with a burst of uncommon energy. Complementing the prior example, this wider low slung sofa takes the minimalist approach, with simple chromed metal framing and a set of angular but soft leather cushions. It’s an elegant but tough look. The great thing about sectionals is that, if you pick the right one, you’ve got the majority of your furniture already taken care of. 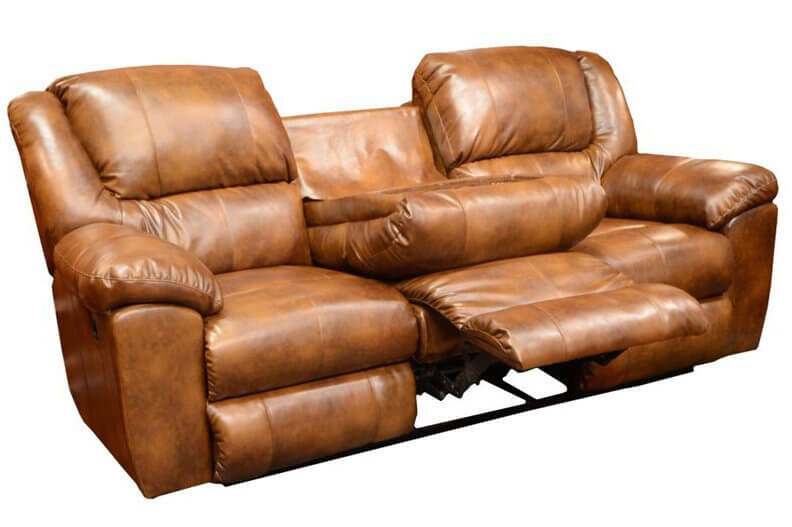 These incredibly useful sofas come in virtually any style to satisfy a range of man cave types. The best examples feature chaise lounges, recliners, or even built-in storage options, and make the most out of your man cave setting. We love a sleek, modern sectional, and this one is no exception. The head cushions can be angled for utmost comfort, while the chaise lounge section adds a layer of relaxation that a standard sofa can’t match. 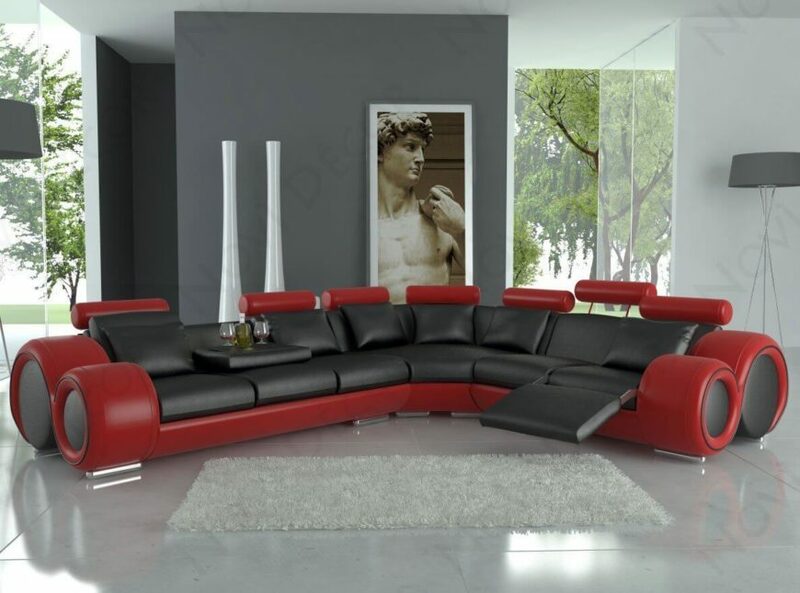 The bulging, rich leather cushions are the first element that stands out on this broad and beautiful dark sectional. The chaise lounge and standard sofa halves share a thick button tufted seat design that stands over a broad hardwood base. 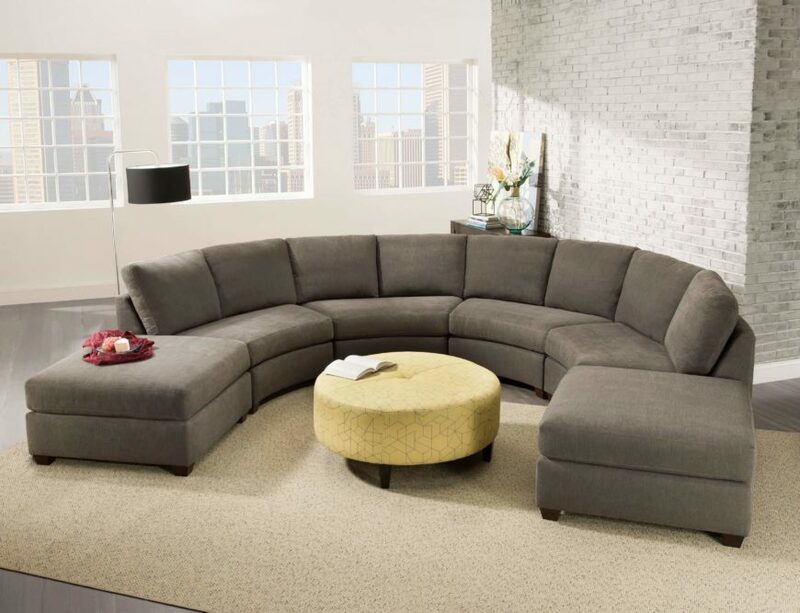 Here’s a unique sectional design, crafted in a broad curved U-shape, rather than the standard L-shaped design. This makes for a more striking appearance in virtually any shape room, but especially so in a large man cave with room to spare. A pair of square ottomans bookends the piece. 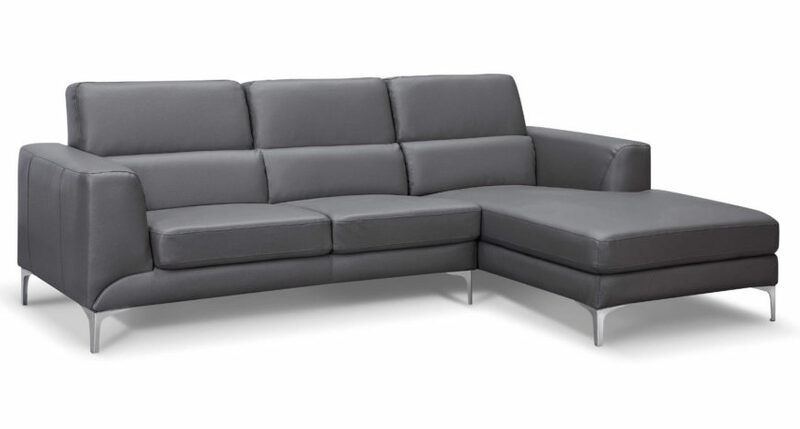 This sectional flaunts a subtly modern design, with a tiered cushioning and a bespoke, subtle chrome frame. The chaise lounge adds a new dimension of comfort and will be the envy of any friends in your man cave. 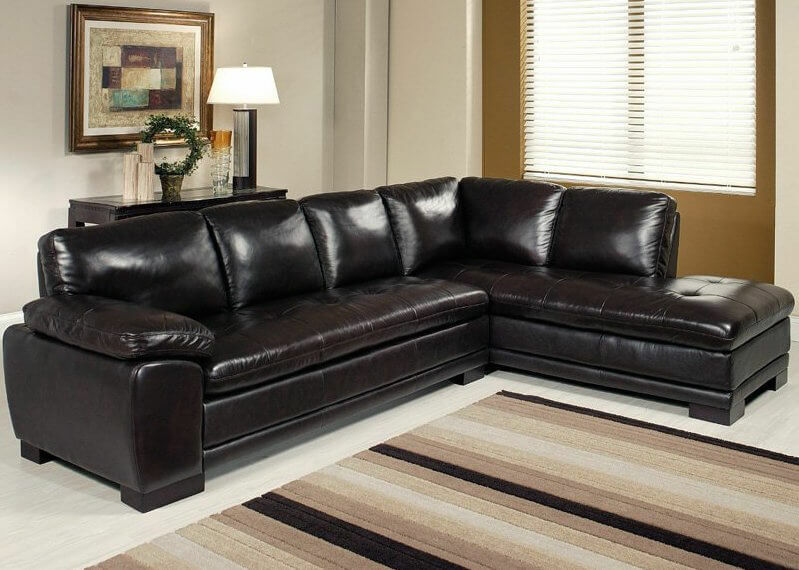 Here’s an immaculately elegant dark leather sectional that will raise the luxury quotient of any man cave you place it in. Rich cushioning is bracketed by roll arms and bright nailhead trim, while the ottoman completes the utilitarian set. 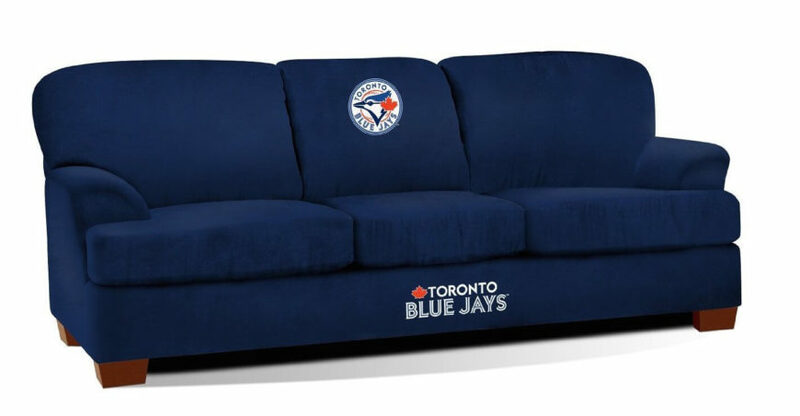 So now we come to the ultimate in modern man cave sectional bliss. This racing inspired two-tone set includes reclining seats, hidden drink trays, and an out of this world sense of style that will be the highlight of any interior. We’ve reached a point in our list where the styles have become a bit less definable, so we’ve grouped this section under the banner of uniqueness. Each of these sofas sports a defining element that sets it apart from its peers. From fresh sectional shapes to sports decals, these beautiful pieces of furniture will make many specifically styled rooms complete. While this sofa may be a sectional, it doesn’t look like the traditional examples you’re likely to see. 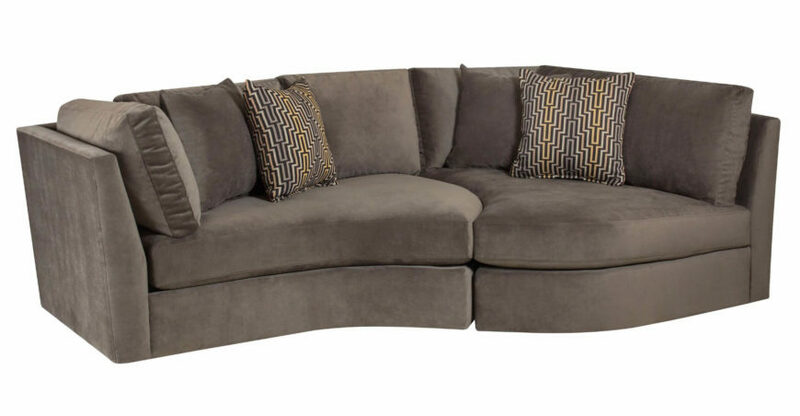 The broad, curved base makes room for abundant comfort space and boasts a chaise that faces into the rest of the sofa. 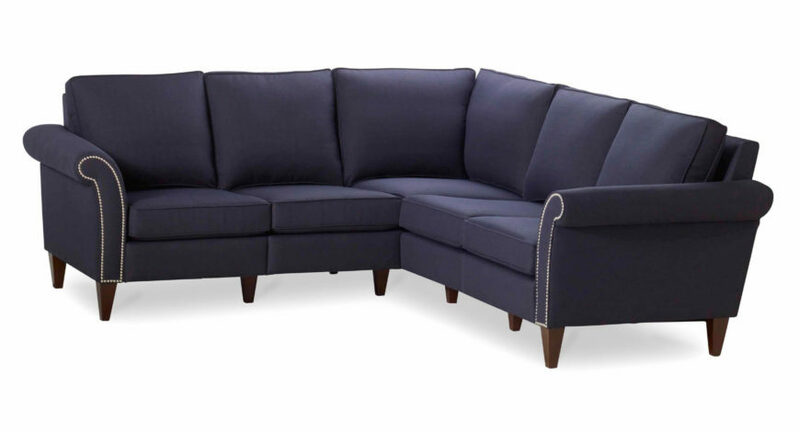 This striking sectional sports a bold navy blue tone, contrasting with the bright nailhead trim on each end, reaching into the elegant roll arms. Subtle dark wood legs support the deeply cushioned but unfussy design. 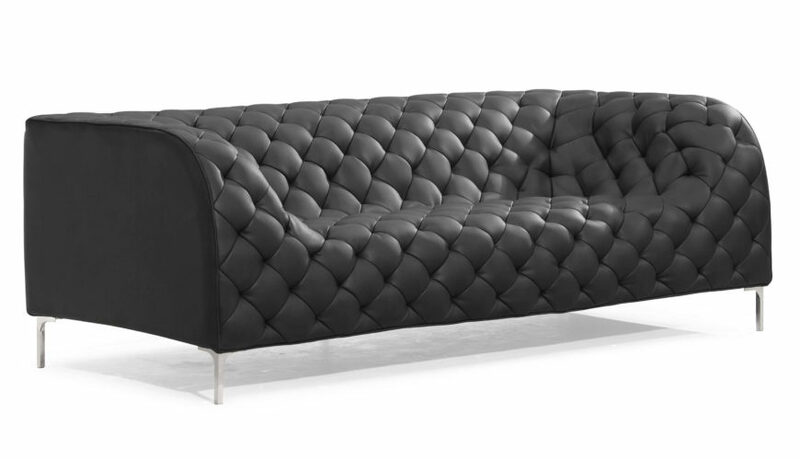 This sofa design is a truly standout example of modern furnishing. 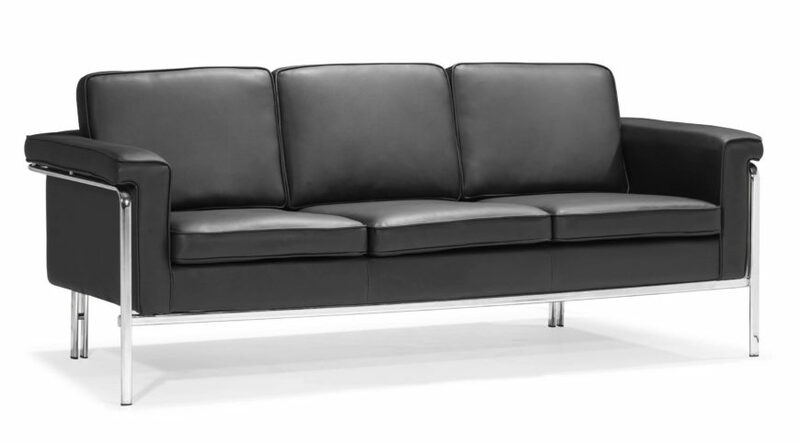 The button tufted leather stretches over a gently curving body that erases the lines between back and seat. The texture grants it a classical air that makes for a uniquely timeless appearance, able to complete a traditional or ultra-modern man cave. 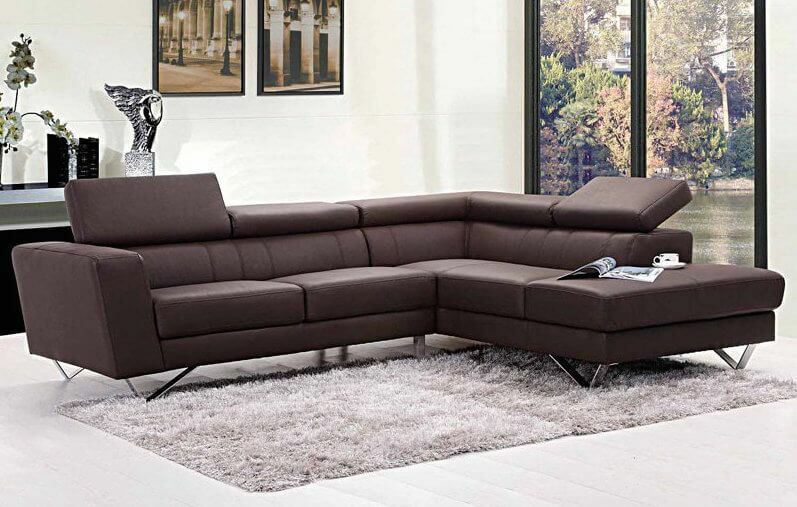 The rich black leather and button tufted backing of this sofa contrast with the clean lines and sharp chrome framework that ensure its modern appearance. With its combination of materials and shape, this sofa would be equally adept at anchoring a traditional or contemporary man cave. 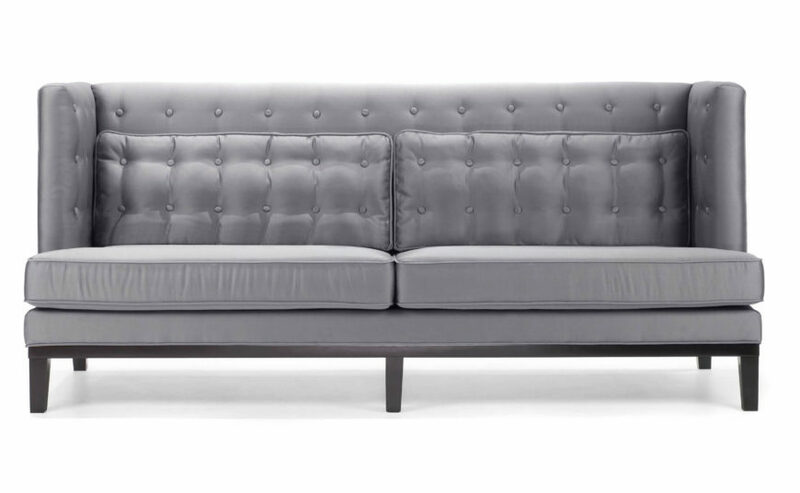 The bright silver tone of this sofa invites a closer look, revealing bespoke button tufting and thick pillow back. The angular, upright frame makes for a timeless look that straddles the line between traditional and contemporary style. The bold navy blue of this modern sofa adds a splash of color to any neutral space or helps to enhance the existing colors in a brighter room. The elegant wood frame and simple curved arms make way for the prominent team logos that will mesh with your sports oriented man cave. This dark leather sofa features bulging cushions and wide arms for utmost comfort, and a bespoke frame that fits with virtually any style room. 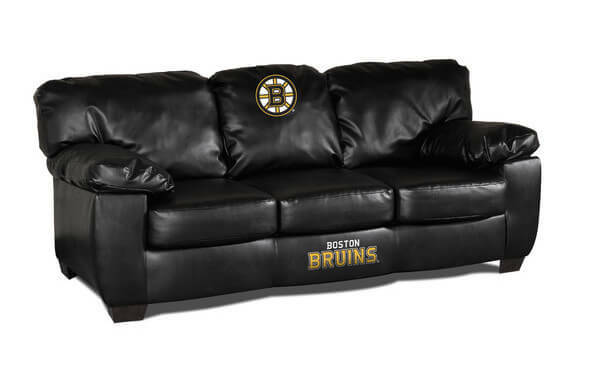 The team logos ensure that your man cave is a serious sports haven. 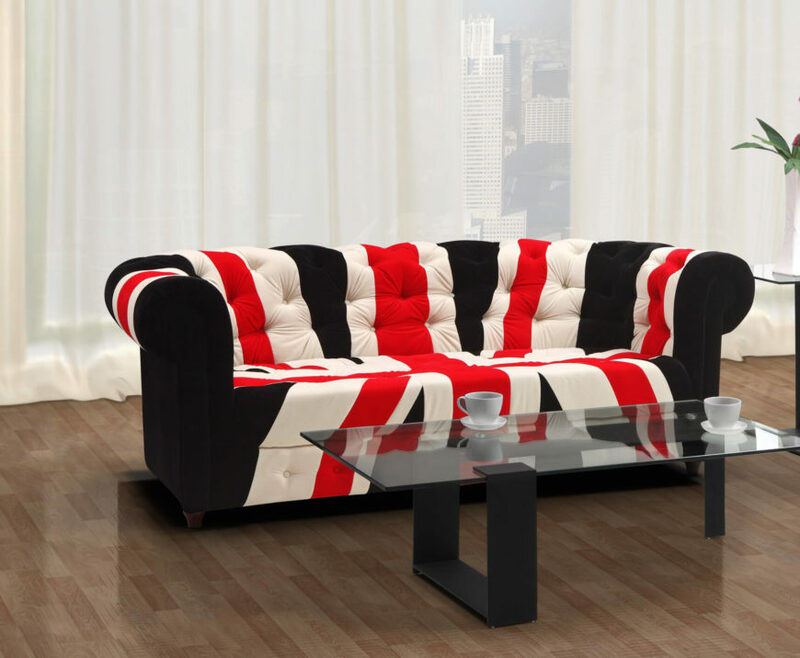 This is our favorite themed sofa in the list, a bright and bold Union Jack design roll arm with thickly padded button tufted backing. The body is framed in deep blue while the brighter colors of the flag make it stand out in any space.